Wales have qualified for the first-ever Commonwealth Games women's sevens tournament on Australia's Gold Coast in April 2018. The Welsh team earned their place by winning the plate final at the Rugby Europe Sevens series in the summer. Wales' men had already qualified. 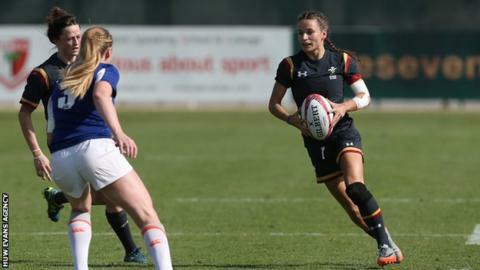 "We're excited there will be a Team Wales female sevens presence when the sport appears on the schedule for the first time," said Helen Phillips, Chair of the Commonwealth Games Wales Board. "The addition of the women's tournament to the sport programme is an important step towards making the Commonwealth Games even more inclusive. "Women's rugby in Wales has seen a huge growth over the past few years and we congratulate the Welsh Rugby Union (WRU) for all the development work that's been done." In 2016 the WRU received Commonwealth Games Federation and Gold Coast 2018 funding, secured by Team Wales, to prepare the women's sevens squad for next year's Games. "I'm so proud that the team has made the Commonwealth Games. They totally deserved it after the hard work in Rugby Europe Sevens over the two legs in Russia and France, resulting in our highest place finish," said Nick Wakley, Head Coach at the WRU. The men's and women's sevens squads will be announced ahead of the Games next year.